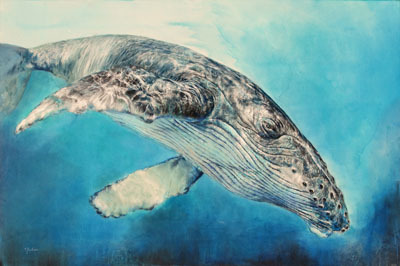 I recieved the "Best in Show" award at the "News Talk ZB 2018 Rotary Art Awards", for my Humpback Whale painting "Mia Paikea". This National Annual Art Show is held at the Paraparaumu Southward Car Museum. Both my entries "Within the Realm" and "The Wanderers" are selected for the 2018 Peters Doig Marlborough Art Awards National Exhibition. I donated this original award winning painting to Tikokino Primary School in Central Hawkes Bay, for their 2017 Charity Auction, on Dec 2nd which sold for $2,000. The event was a huge win for this small country school, raising $10,157 for the resurfacing of the sports ground. Established in 1866, four generations of my extended family between 1926 - 2018, including my Grandfather and Mother, were schooled there. My grandfather a young child in the 1920s, rode to and from on his pony. NZ children often did in country schools in the 1920s through to the 1950s. 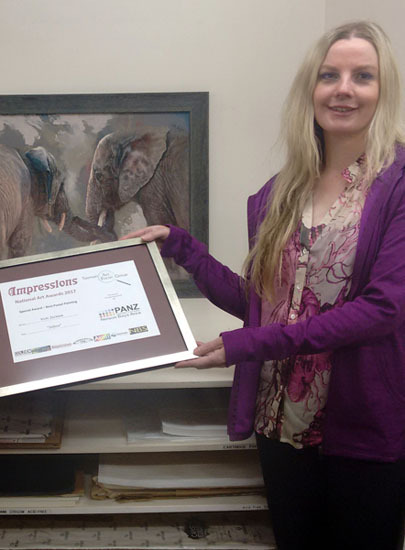 I am stoked that my artwork Solace was included in the Impressions National Art Awards Exhibition and received the win for the inaugural Best Pastel Painting. Double stoked and very thankyou to the kind voters that it also received the NBS Peoples Choice Prize. Honoured to have both my works selected in this awe-inspiring New Zealand National Exhibition. Little bit excited to be showing a collection of works in beloved Canterbury. 10/04/2016 - Portrait of a Monarch was selected for the 2016 Peters Doig Marlborough Art Awards. Exhibited at Yealands Estate Marlborough Art Gallery  1st May to 29th May 2016. 2017 Best Pastel Painting, Impressions National Art Awards Exhibition. 2017 NBS Peoples Choice Prize, Impressions National Art Awards Exhibition. 2016 Peoples Choice Award, PANZ Southern Pastel Artists ILT Art Awards Exhibition. 2016 Overall Winner Award, Cheeky Challenge, The NZ Artist Magazine. 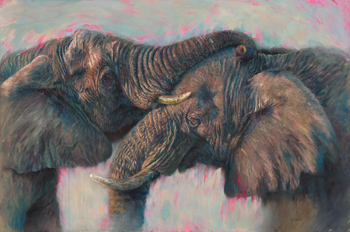 2016 First Prize Pastel Category Award, Cheeky Challenge, The NZ Artist Magazine. 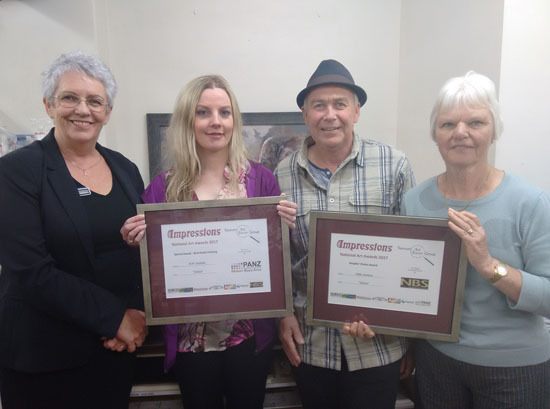 2015 Peoples Choice Award, Kaikoura Art Society Annual Exhibition. 2015 Overall Highly Commended Award, Kaikoura Art Society Annual Exhibition. 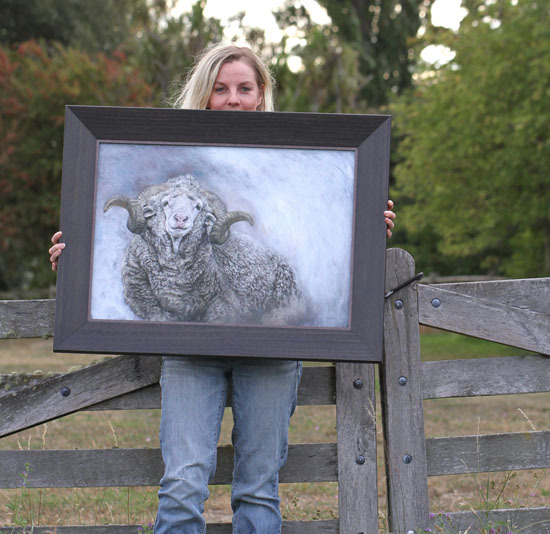 2014 Peoples Choice Award, 1st Place, Kaikoura Art Society Annual Exhibition. 2013 Peoples Choice Award, 1st Place, Kaikoura Art Society Annual Exhibition. 2012 Merit Highly Commended Award (3rd), PANZ National Exhibition. 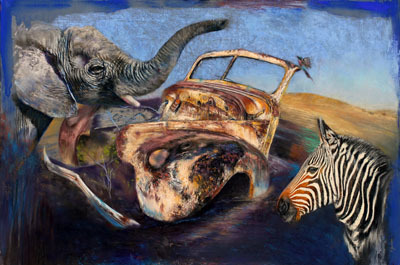 2012 Commended Award, PANZ Southern Pastel Artists ILT Art Awards Exhibition. Artists ILT Art Awards Exhibition. 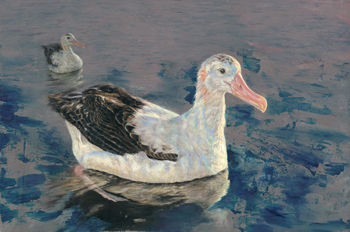 2008 Peoples Choice Award, Pastel Artists of New Zealand Top of the South Exhibition. 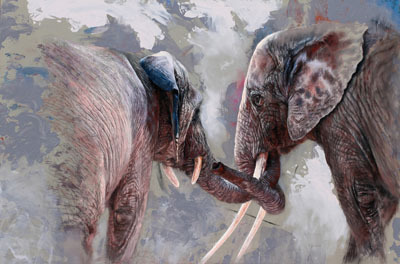 2008 Highly Commended Award, PANZ Southern Pastel Artists ILT Art Awards Exhibition. 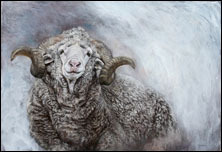 11/15 - Stoked that my painting Merino Ram-Wairau Valley was awarded Overall Highly Commended and the Peoples Choice at the 2015 Kaikoura Art Society Annual Art Show. 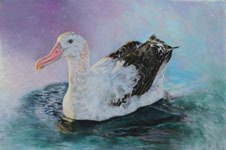 05/15 - Antipodean Albatross II was selected for the countries prestigious Peters Doig exhibition at Yealands Estate Marlborough Gallery. 07/14  Delighted the 2014 Paws for Charity Project is featuring my artwork, along with over 80 artists and photographers from around the world. This special project by fundraiser and artist Sara Hartley, directly benefits the Sheltering Helpless Animals in Distress shelter in Nova Scotia, Canada. Purchasing a hard copy or e-book provides 100% profits to these animals in need. You will receive a beautiful coffee table book, or mobile image gallery featuring many amazing animals and artists. 23/07/14 - Blurb Books created a short video about the Paws For Charity Project in December 2013, and it has just been released. You can view it by clicking on this link: http://youtu.be/4gNnVdOhpCY?list=UUUNzMdqJM0mcU8uvrRrpgQQ Credit: Karen Weiler ( poshpetsphoto.com ) for helping with the filming of this video! 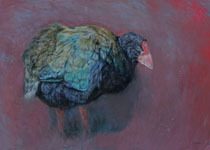 Vicki and her award winning Kereru at the National Purely Pastel Exhibition 2012.